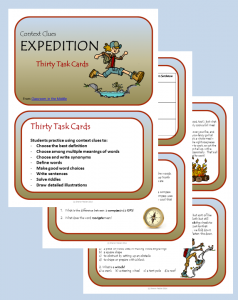 For a class of middle grade kids who love to work in groups and love to move around the room, task cards can be your go-to resource. They are so handy to have around and pull out throughout the year as needed. 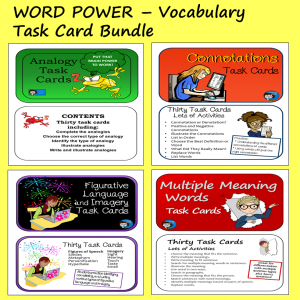 And task cards work great for any language arts skills – reading, writing, vocabulary, and more. For this age group I definitely prefer cards with a more content per card so that the kids spend a little more time on each activity. 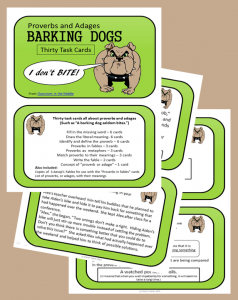 Many of my task card sets include a reading passage on each card, and most have three to four questions per card. 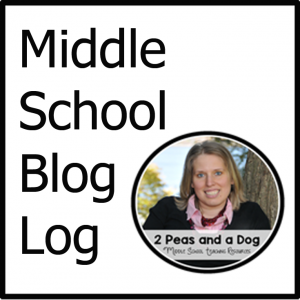 For middle grade kids, this seems to be a good length – long enough for them to really get engaged but short enough to keep them motivated. Here are some of my favorites, from my Teachers Pay Teachers store. Each set includes 30 cards. The cards have colorful borders and a white background and print well in black and white or color. 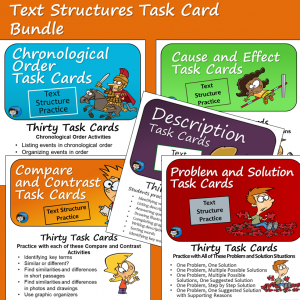 For working on specific reading skills, I have three sets now including task cards about characterization, making inferences, and using context clues. 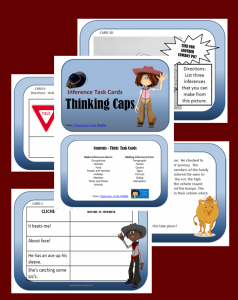 Thinking Caps is all about making inferences. Students make inferences from paragraphs, quotes, cliches, signs, pictures, and more. 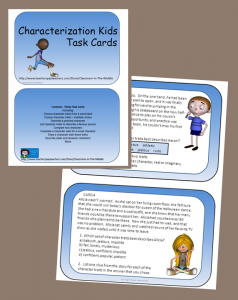 They will make inferences about occupations, food, people and families, the weather, a recipe, and other topics. Some, but not all, of the cards are cowboy themed. My two newest sets are about Idioms, proverbs, and adages. 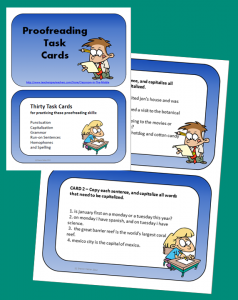 One of my favorite sets is the Proofreading Task Cards. This set is for practice with types of errors that students commonly check for when they are proofreading their work. The topics include punctuation, capitalization, grammar, run-on sentences, homophones, and spelling. Great for individualizing when practice on particular proofreading areas is needed. 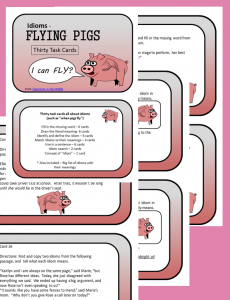 Parts of Speech Task Cards includes three cards each about nouns, verbs, pronouns, adverbs, adjectives, prepositions, and conjunctions, and one card about interjections. 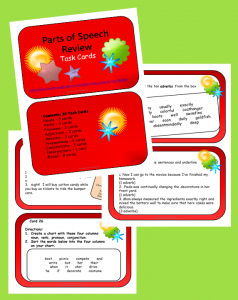 In addition, there are eight cards that are each about several or all of the parts of speech. The activities include sorting for parts of speech, adding a particular part of speech to a sentence, listing words of a particular part of speech and using them in a short passage, matching, unscrambling sentences, and labeling the parts of speech in a sentence. 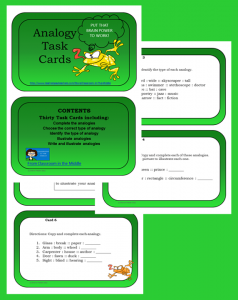 Analogy Task Cards includes tasks such as completing a group of analogies, choosing the correct type of analogy from multiple-choice answers, identifying the correct type of analogy without assistance, illustrating analogies, and writing analogies. 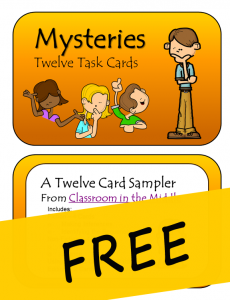 And finally, the newest addition to Classroom in the Middle’s collection — Mysteries, a FREE set of 12 reading task cards, some fiction and some non-fiction, with a mystery theme. 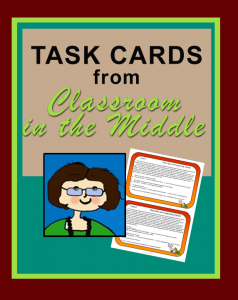 Get this FREEBIE, and check out the other choices in my Teachers Pay Teachers store, Classroom in the Middle. 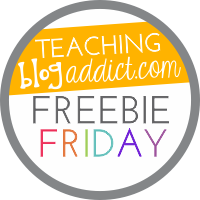 Linked with Teaching Blog Addict for Freebie Friday.